Video episode #281: The Martini is a 3oz. drink - at the Prohibition Pig. The Guys make their way back to Waterbury, Vermont, to close a circle started in motion by John and Jen Kimmich, and furthered by the tragedy that was Hurricane Irene; the Prohibition Pig now takes full possession of the space once occupied by The Alchemist Pub and Brewery. Learn just how cool the new place is, their philosophy of food and drink, and just why you should run - not walk - to get there as soon as possible. Cheers! 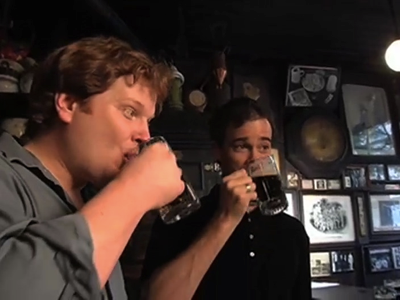 Video #1: The Pilot Episode: McSorley's Old Ale House! We had a ridiculously fun time shooting our pilot episode of HAPPY HOUR at McSorley's Old Ale House. The granddaddy of bars here in NYC, McSorley's and its staff didn't disappoint. So much interesting material had to be left on the editing floor. Well, not literally because it doesn't work that way anymore, but you get the idea. Many, many interesting things are on the walls and around the bar. Look for the handcuffs on the foot rail of the bar- Harry Houdini escaped from them one night on a dare from the owner. Ask about the original wanted poster for Abe Lincoln's assassin or the dusty wishbones hanging from a candelabra over the bar. There's a story behind everything. Pepe, the daytime bartender seen in our pilot, knows about it all and is willing to tell you. He's also full of stories about the many celebrities who've come through McSorley's doors. Jimmy had a great time interviewing him. Maybe some outtakes will appear at some point...who knows. We're always on the lookout for new spots, so write to us with your favorite weird, historic, funny, unique watering hole!